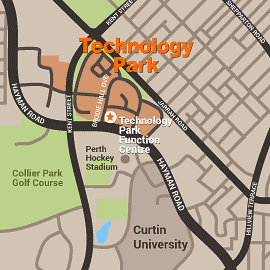 Technology Park Function Centre is one of Perth’s leading corporate venues. We are located only 6 kilometres from the CBD and nestled in the heart of the State’s premier science and innovation area, Technology Park, Bentley. At Technology Park Function Centre, we offer a choice of 7 different training rooms that can cater to a small 3 or 4 person workshop right up to a 200 person conference making it an ideal location to host your next corporate or training event. Our Function Centre event coordinators will work closely with you to make your next corporate function a professional and stress free experience. They can help you to decide the most appropriate room, layout and additional equipment required to suit your event needs. Our function rooms are extremely versatile, can be setup to your exact requirements and feature quality audio visual equipment, high-speed wireless internet, whiteboards, flipcharts, notepads and pens. Your guests will also not have to worry about getting a park as we have 150 free parking bays and then an extra overflow carpark for larger events. Catering is done onsite by La Mint Cafe who will impress your staff and guests. La Mint’s menus feature a delicious range of canapés, desserts, hot and cold food, buffet menus and tea/coffee options. They have options for everyone and their packages can be tailored to suit any number or budget. For more information click on our “Cafe and Catering” tab.